This type of smooth sawn, architecturally uniform cedar shingle is preferred for it's natural and tailored appearance and is used on traditional, modern and non-residential structures. For use on roofs and sidewalls. The premium grade of shingles for roofs and sidewalls. 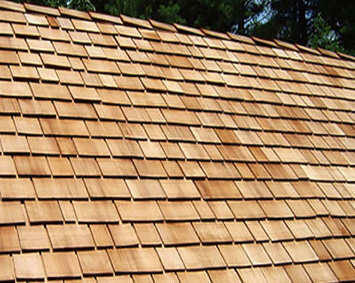 These top-grade shingles are 100% heartwood, 100% clear and 100% vertical-grain. Available in 16", 18" or 24" lengths. Description: Lengths- 16" (5x), 18" (Perfections) and 24" (Royals). Width- 4" minimum on 24" and 3" minimum on 16" and 18". Thickness- 16" = 5/2" (5 butts together measures 2" thick), 18" = 5/2.25" (5 butts together measures 2.25" thick) and 24" = 4/2" (4 butts together measures 2" thick). Clear heartwood, 100% vertical-grain, no defects. RECOMMENDED USE: For walls and roofs on a 3:12 pitch and steeper where a premium quality product is desired. A good grade for many applications. Not less than 10" clear on 16" shingles, 11" clear on 18" shingles and 16" clear on 24" shingles. Flat grain and limited sapwood are permitted in this grade. Description: Lengths- 16", 18" and 24". Width- 4" minimum on 16", 18" and 24". Thickness- 16" = 5/2" (5 butts together measures 2" thick), 18" = 5/2.25" (5 butts together measures 2.25" thick) and 24" = 4/2" (4 butts together measures 2" thick). Face must be 10", 11" or 16" clear or better on 16", 18" and 24" respectively. Limited sapwood and flat grain are allowed. Limited knots and defects are allowed above the clear portion. RECOMMENDED USE: For walls and roofs on a 3:12 pitch and steeper where a good quality product is desired. 4:12 & Steeper 16" 18" 24"
Also available in Fire-treated. Class B & C fire ratings may be obtained by specifying Certi-Guard® pressure impregnated fire-retardant treatment, on number 1 grade product.